Canada wasn't always known for whisky, but distillers are changing that notion and producing some of the best bottles in the world. A visit to the blending lab for Crown Royal, Canada’s best-known whisky maker, uncovers a spirits lover’s dream office. Pristine filing cabinets slide open to reveal row upon row of meticulously organized flasks. Inside the drawers, whiskies in every conceivable shade are lined up like the ultimate box of crayons, from crystal-clear, unaged distillate to deep, dark amber developed through years of barrel rest. The various ages, grain combinations and flavors of whisky are all represented. In many ways, these cabinets are a metaphor for Canadian whisky itself. Once considered mellow and monotone, producers have transformed the category into a riotous rainbow of bold, interesting bottlings. 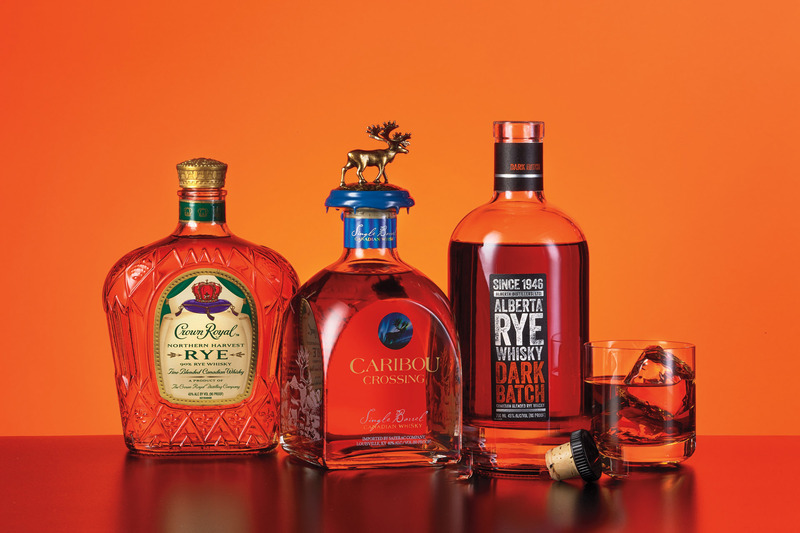 Whether it’s Crown Royal’s Northern Harvest Rye, a lean, peppery whisky made with 90% rye and named 2016’s World Whisky of the Year in Jim Murray’s annual Whisky Bible or, on the other end of the spectrum, comforting, caramel-forward bottlings like Caribou Crossing, Canadian whisky is ringing up sales for good reason. According to the Distilled Spirits Council of the United States, sales of Canadian whisky in the U.S. rose 7% between 2011 and 2016, with a 112% spike in the high-end premium category. “The whisky world is waking up to Canadian whisky and declaring it among the best whiskies in the world,” says Davin de Kergommeaux in the second edition of his book, Canadian Whisky. Bars and restaurants in the U.S. are also adding Canadian bottlings to spirits lists. While Canada’s whisky history parallels that of America, the two would diverge. It’s why there are differences in how whisky is made and how it tastes across the border. The stories began similarly. Settlers from Europe arrived in North America with knowledge of traditional distilling techniques, which they applied to the abundant grains—corn, wheat, barley and rye—they discovered in the new world. While corn, required to make Bourbon, was long the dominant ingredient in American whiskey, rye became the key player in Canada’s whisky history. Favored by Dutch and German immigrants, the hardy grain thrived in the cooler northern climate. America grew and distilled the grain as well, but in Canada, rye-based whisky was so prevalent that for decades, all Canadian­ whisky was referred to simply as “rye.” Its spicy character is considered a signature of Canadian bottlings. But agriculture and consumer tastes evolved. Corn is now the most commonly used grain in Canadian whisky, except for a handful of rye-focused bottlings. The Prohibition years provided another point of divergence. While American liquor was forced underground and into private homes and clubs during the 1920s, Canada continued its whisky- making traditions. De Kergommeaux­ estimates that during those years, Canadian whisky made up about 10% of alcoholic beverages consumed in the U.S.
By the time Prohibition ended in 1933, many of America’s distillers had long abandoned their craft. In many cases, a new generation of producers started over with different processes, recipes and equipment. Canadian counter­parts, meanwhile, enjoyed more continuity in production. Although Canadian whisky thrived in the 1950s through ’70s, consumer tastes for white spirits, particularly vodka, eroded sales over the following two decades. Canadian distilleries consolidated, and many closed. Eight large conglomerates remained by the 2000s, and Canadian whisky was considered­ something your grandfather drank. Don Draper quaffed Canadian Club on Mad Men. Yet, a whisky revolution was brewing. “Canadian whisky is starting to wake up a little bit,” says Dr. Don Livermore, master blender at Hiram Walker & Sons Limited/Pernod Ricard Canada. He’s responsible for whisky brands that include Lot 40, JP Wiser’s and Pike Creek. Livermore refers to the industry’s response to the increased demand for whisky across all categories. It started as a groundswell for Bourbon and Scotch, and it has expanded to countries like Japan and Ireland as curious whisky drinkers embrace a wider range of world whiskies. Until recently, Canada’s whisky attracted limited attention. It was often viewed as light and traditional. In other words, it was largely forgettable. Over the past decade, however, Canadian distillers have been building memorable drams. These new stylings showcase the range and potential behind the category. “Canadian whisky is the most innovative, creative and adaptable style whisky there is,” says Livermore. Compared to Scotch or Bourbon, two styles laden with regulations that can hamper experimentation,­ Canada’s whisky makers have a fairly broad mandate. That means the door is wide open for Canada’s distillers to innovate. They can work with a wide range of barrel types or finishes, any combination of grains or any distillation method. It’s not a problem to add a measure of oloroso Sherry to the mix, which contributes intriguing dark, earthy notes to Alberta Rye Dark Batch Whisky. And while Scotland requires oak barrels to make Scotch, there’s nothing to stop Canada from using maple wood, part of the aging process for brown sugar–tinged Collingwood. He says that consumers, younger ones in particular, seek bigger, bolder flavors like spicy rye, as well as high-end premium bottlings. Much like the craft beer movement, a growing number of small distilleries bring new energy and bold flavors to the Canadian whisky scene. At tiny Cirka Distilleries in Montreal, one of Canada’s 40-plus micro-distilleries (by comparison, the U.S. has hundreds), for instance, whiskies made with local grain are only halfway through their mandated three-year aging time. Yet, a 100% rye whisky pulled directly from the barrel already snaps with notes of chocolate and cherry. Canada is also doubling down on education to familiarize consumers with the country’s native spirit. John Hall of Forty Creek Distillery, now owned by Gruppo Campari, helped rebuild Canada’s reputation in terms of both openness and quality. When Hall, a winemaking veteran, started the operation in 1992, he noticed that the country offered few small-batch whiskies, especially when compared to the variety of selections from Scotland or the U.S.
Hall is now retired from the whisky business, but small-batch bottlings abound, a tribute to his legacy. Another sign of the times: After years of near-secrecy, distilleries now welcome consumers with visitor centers and tasting rooms. In addition to many micro-distilleries that offer tours and tastes, Hiram Walker now features a “J.P. Wiser’s Experience” in its Ontario distillery. Sazerac, too, has plans to soon welcome visitors to its Old Montreal Distillery, just a short walk across the bridge from historic Old Montreal. Whisky hadn’t been made on-site in decades, but that changed in January when production resumed thanks to a newly installed 37-foot copper still. Long term, Sazerac’s plan is not to just make Canadian­ whisky, but to innovate with a wide range of single-barrel and small-batch experiments. The company has plenty of bona fides when it comes to this endeavor. Harlen Wheatley, the master distiller at Buffalo Trace known for producing groundbreaking Bourbons in his experimental warehouse in Kentucky, is consulting on the project. If in the past, Canadian whisky was derided as boring, or in Hall’s words, “same old, same old,” these whiskies will surely be anything but. “What Buffalo Trace did for Bourbon, we want to do for Canadian whisky,” says Gerry Cristiano, plant manager for Sazerac’s Canadian whisky operations. He motions to a lineup of barrels, already filled with distillate, at the far end of a mostly empty warehouse. Buy these bottles, if you can get your hands on them. They’re easy to enjoy now, though they are also excellent collectors’ items. If you’re bound for the Great White North, be sure to leave room in your suitcase. These were only released in Canada. This special bottling was released in 2017 to commemorate Canada’s 150th birthday, and it’s the oldest Canadian whisky ever bottled. It’s rich, creamy, flavorful and has plenty of peppery rye and oaky vanilla; only 7,000 bottles were released. Part of the 2017 Northern Border “Rare Release” collection, this 21-year-old Canadian whisky was finished in a Speyside Malt cask. It was an experiment to demonstrate “how whiskies from Scotland and Canada can complement one another to give a smooth and round sipping whisky,” according to the producer. Tasting Scotch with "The Nose"